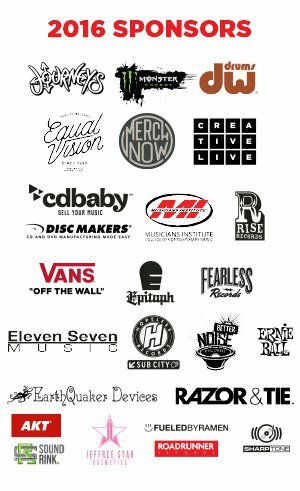 Each year, the Journeys Alternative Press Music Awards, Fueled by Monster Energy brings fans exciting collaborative performances from today's most celebrated alternative music artists. Previous performances combining the talents of Slash and Joan Jett & The Blackhearts; Asking Alexandria and Korn vocalist Jonathan Davis; Falling In Reverse, Coolio and Tyler Carter of Issues; Halestorm and Slipknot/Stone Sour vocalist Corey Taylor and more have dazzled audiences worldwide. 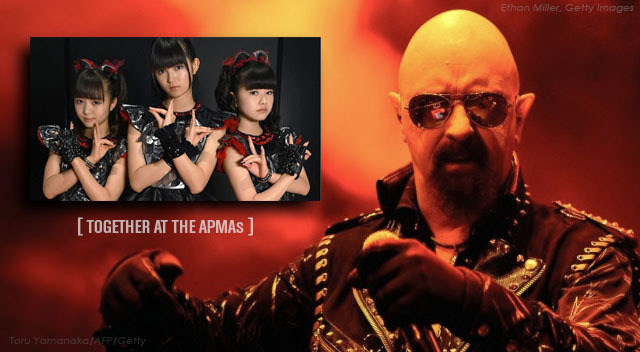 The 2016 APMAs will present even more of these incredible performances -- the first of which will feature none other than legendary heavy metal vocalist Rob Halford of Judas Priest and pop metal phenomenons and Best International Band nominees BABYMETAL! Combining raw 1970's-era classic heavy metal influences with fresh modern visuals and Japanese pop styles, this performance will be a can't-miss moment amidst the evening's festivities. In the official Alternative Press video announcement, BABYMETAL's SU-METAL states, "I am still at a loss of what to feel, but to be able to perform together with the metal god, I am in disbelief... I know it will be an amazing experience for us and I am really looking forward to it." BABYMETAL, the breakout all-girl-fronted Japanese heavy metal/teen-pop hybrid group featuring 18-year-old SU-METAL and 16-year-olds YUIMETAL and MOAMETAL, backed by a four-piece band, released their sophomore album Metal Resistance this past April (debuting atop Billboard's "World Albums" chart and iTunes' "Top Heavy Metal Albums" chart) and took the world by storm when they made their U.S. late-night TV debut on The Late Show with Stephen Colbert (April 5). Rob Halford of Judas Priest defines the ideals, imagery and musicality of heavy metal. He has become an icon of the industry and Judas Priest have reigned as one of the most influential and popular metal bands of all time since their formation in 1969. From one decade to the next, Halford has led the way with an aggressive, yet melodic vocal delivery and a ferocious scream that could crack the ceiling of the Sistine chapel. After their groundbreaking 1990 album, Painkiller, Priest and Halford parted company for a few years, but in 2004, Halford resumed his role as frontman with Judas Priest and they have continued to record head-banging, jaw-dropping metal and perform sold-out concerts for arena and stadium audiences across the world. Halford adds, "It's really cool to hear and watch such a strong young Japanese metal band make solid growth in the world with such unique conviction and invite me to head bang along with them for this special appearance. Further proof of the continuing power exchange from the roots of metal into the future metalsphere!" This year's APMAs, hosted by Alex Gaskarth and Jack Barakat of eight-time AP cover stars All Time Low, will broadcast live the evening of July 18 from the Schottenstein Center in Columbus, Ohio (schottensteincenter.com). 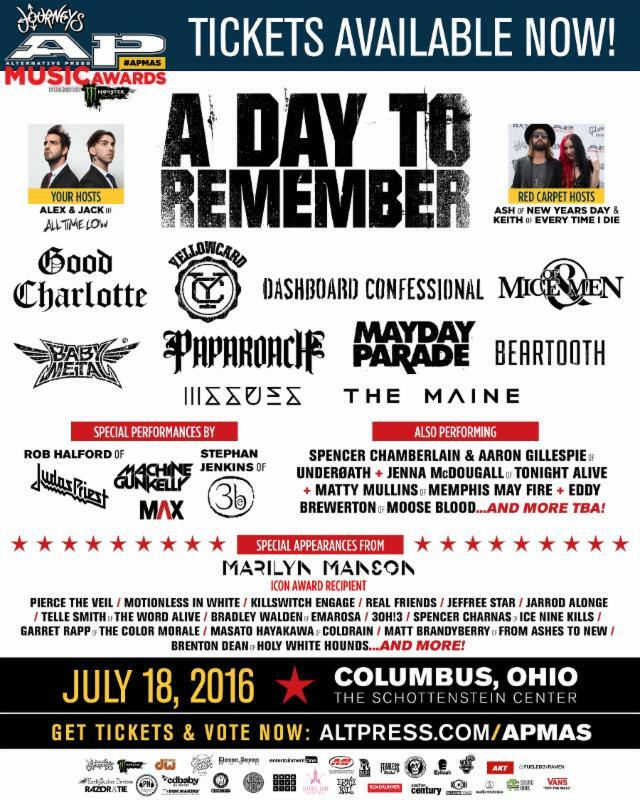 The APMAs are offering a "punk-rock convention" as an alternative to the Republican National Convention taking place in the magazine's hometown of Cleveland that night. The star-studded red carpet will once again be hosted by infectious frontman Keith Buckley of Every Time I Die and macabre beauty Ash Costello of New Years Day. Fans can watch the red carpet from their mobile devices via Facebook live stream with APTV correspondent Nick Major. In addition to the collaborative performance from BABYMETAL and Judas Priest's Rob Halford, Dashboard Confessional will take the stage, plus special guest performances including Stephan Jenkins of Third Eye Blind, Jenna McDougall of Tonight Alive, Machine Gun Kelly, MAX, Eddy Brewerton of Moose Blood and Matty Mullins of Memphis May Fire. Additional special guest appearances will be made by Pierce The Veil, Motionless In White, Jarrod Alonge, Telle Smith of The Word Alive, Bradley Walden of Emarosa, Garret Rapp of The Color Morale, Spencer Charnas of Ice Nine Kills, Brenton Dean of Holy White Hounds, Matt Brandyberry of From Ashes To New, Real Friends, 3OH!3 andKillswitch Engage. More guests appearances to be announced shortly. Other 2016 APMAs performers include platinum-selling headliners A Day To Remember, Good Charlotte, Yellowcard, Of Mice & Men, Papa Roach, Issues, the Maine, Mayday Parade and Beartooth, with more artists still to be announced. The 2016 APMAs also will feature a special appearance from Spencer Chamberlain and Aaron Gillespie of Underøath. This year's Icon Award, presented by Equal Vision Records/MerchNOW, will be awarded to platinum-selling rock legend Marilyn Manson. ONLY 30 DAYS LEFT TO VOTE! Visit the APMAs Vans Voting Site at altpress.com/apmasvote2016 to check out all of this year's nominees and vote for your favorites now! Voting has become an international phenomenon, with ballots coming in from over 130 countries. Also, visit this location for information regarding future performing artists, honorees and presenter announcements, tickets and VIP packages, pre-show parties, red carpet appearances and beyond. Alternative Press Music Awards tickets are on sale now via Ticketmaster here. VIP experience packages are available via SoundRink-An Experience Company-and will include limited merchandise, elite access to the red carpet and prime indoor seating and VIP meet-and-greets. The VIP Pit Experience is for the loudest, most energetic fan of the APMAs. This is the best experience for the fan who wants to be so close to the action that they're a part of it, themselves. Tickets are extremely limited! The VIP Pit Experience is located in the center of the largest stage the APMAs has ever had. The stage features a large V-thrust that makes every seat the best seat in the house. Pick up your VIP Pit Experience tickets now viawww.altpress.com/pit. Last year's trending event earned the title of "The GRAMMYs of Alternative Music" from TIME Magazine. The 2015 Alternative Press Music Awards achieved over one million views on AXS TV and over three million views on YouTube. Re-live 2015's best moments via the highlight reelhere. The APMAs have featured performances by some of today's biggest rock artists and bona fide legends-from Fall Out Boy, Twenty One Pilots, Panic! At The Disco and Paramore's Hayley Williams to Weezer, Joan Jett and Guns N' Roses co-founder Slash. Don't miss the 2016 Alternative Press Music Awards and your chance to cast your vote for your favorite bands! Check altpress.com/apmas over the coming weeks for new announcements and information.